Ultra high performance with ultra low noise – the Bambi MD range. Designed for applications demanding the highest quality air supply with all the benefits of very low noise levels. At the heart of the range is the oil lubricated T75 pump unit developed to deliver 50% more air compared to other silent compressors and the only silent compressor fitted with piston rings eliminating oil carryover to the air supply. 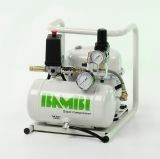 Bambi compressors have been designed to maximise efficiency and ensure years of trouble free operation, which together with our comprehensive warranty extending to 5 years on the air receiver explains why so many are in use worldwide in all types of vital applications.